Red Cedar Coffee Co. is pleased to partner with local branches of the Cuyahoga County Public Library as part of their Friends of the Library fundraiser program. 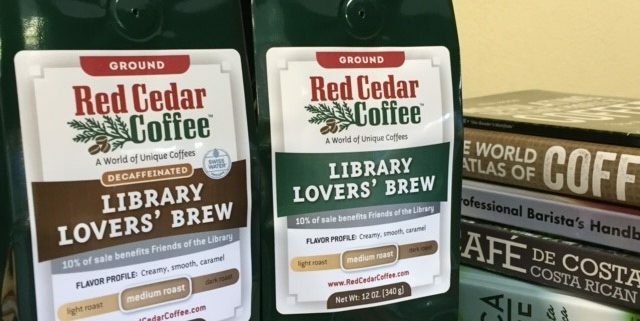 The Library Lovers’ Brew is available only at select branches (Strongsville, Bay Village, Berea, Middleburg Heights) in twelve (12) ounce bags of ground regular and Swiss Water Processed decaf. The Library Lovers’ Brew is a creamy, smooth medium roast created only for the Friends of the Library. A portion of each sale goes back to the Friends of the Library group and will provide funds for use towards the library, future library events and programming. Read more here for information on the Strongsville branch program. Support your local library and enjoy some great coffee along the way. June 1, 2017 /by Anne D.